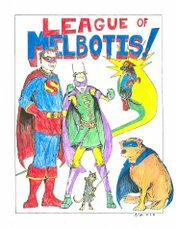 League of Melbotis: You can help Melbotis! That's a lot of clicking to get to Mel. I'm not sure he stays at 192. I just went there and there was some other dog. Whoop. Apaprently this is some sort of sliding Golden Retriever scale. How sad that Mel will not be the best Golden Retriever in Austin. Hey, everyone knows you can't trust the mainstream media. Mel is still the best Golden Retriever in Austin, but just sort of in a hip, indie, underground way.